Algeria's Bouteflika confirms run for 5th term - SABC News - Breaking news, special reports, world, business, sport coverage of all South African current events. Africa's news leader. ( Bouteflika is under huge pressure to resign after the army called for his removal and allies deserted him. Ailing President Abdelaziz Bouteflika declared he will seek a fifth term in April elections in a message published by state media Sunday, after he was endorsed by his party and the ruling coalition. “Of course, I am no longer the same physical force as before — something that I have never hidden from the people,” said Bouteflika, according to the APS news agency, as he apparently broke his silence on his intentions for the April 18 poll. “But the unwavering desire to serve… has never left me and it allows me to transcend the constraints linked to health troubles which everyone may one day face,” the president reportedly added. 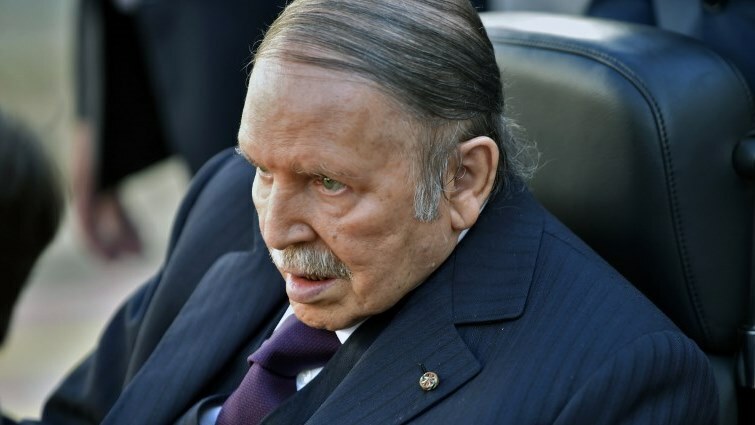 Known for wearing a three-piece suit even in the stifling heat, Bouteflika gained respect from many for his role in ending Algeria’s decade-long civil war, which official figures say killed nearly 200,000 people. He took advantage of the rise of the oil prices between 2004 and 2014 to launch vast infrastructure programmes and pull Algeria out of debt. But the country’s hydrocarbon-dependent economy was hit hard by a drop in crude prices during the president’s fourth term, and now nearly a third of Algerians under 25 are unemployed. If re-elected, he would set up an “inclusive national conference” to address “political, economic and social” issues and “propose an enrichment of the constitution”, APS reported. This conference would be mandated to establish “a consensus on reforms and changes” in Algeria, the president’s message said, but added that he would be the one to act on conclusions. “A stronger presence of young people” inside political institutions, economic reform and a scaling back of bureaucratic red tape would be among the topics to be discussed at the conference. Former prime minister Abdelmalek Sellal — who ran the incumbent’s successful presidential bids in 2004, 2009 and 2014 — has once again been named campaign manager. The president has come up with “a strong and new plan” involving economic and political reforms to enact for the benefit of Algerians, Sellal told private TV network Ennahar. The country’s four-party ruling coalition — which includes the president’s National Liberation Front (FLN) — backed Bouteflika earlier this month. Prime Minister Ahmed Ouyahia has said Bouteflika’s health is not “an obstacle” to performing presidential duties. His continued backing by the establishment makes him a firm favourite. Algeria’s main Islamist party, the Movement for the Society of Peace, will also take part, backing its candidate Abderrazak Makri. It has said Bouteflika would be unable to handle the demands of another term in office because of his poor health. The country’s oldest opposition party, the Front of Socialist Forces, announced last month that it would not field a candidate and called for an “active, intensive and peaceful boycott”. Presidential candidates have until March 3 at midnight (2300 GMT) to submit their applications. For the last presidential election in 2014, Bouteflika had only declared his intention to run a few days ahead of the deadline. This entry was posted on 10 Feb 2019,09:07PM at 9:07 PM and is filed under Africa, News, Homepage Latest Stories Slider. You can follow any responses to this entry through the RSS 2.0 feed. Both comments and pings are currently closed.